Hi guys! This is the second movie that I watched and reviewed. 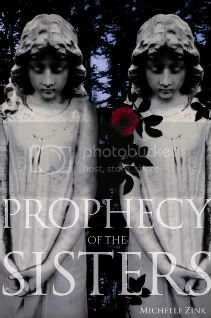 the Gothic Film Club, hosted by Write for a Reader and is sponsored by the glorious, wonderful Michelle Zink, author of Prophecy of the Sisters. You can join too by clicking on Write for a Reader's link above. If you do review a book, you're in the pot to win some serious goodies. So this week, my fiance made the decision of what we were going to watch. He basically said, "What do you mean you've never seen The Crow?" and off to the movie store we went. Main synopsis: Eric and his fiance were murdered the night of Halloween, a night in the city where criminals come out to create chaos. Eric is thrown out of a window and his fiance is raped and beaten and then fought for 30 hours in a hospital before her body gave up. Well, Eric comes back from the dead to revenge his fiance's as well as his own death. First of all, I must say that the main character in The Crow - Eric - reminded me a lot of the Joker, only a semi-good-guy. He had the same type of face make-up, only more simple - just black and white. I also love the young street girl Sarah who was friends with the couple when they were alive. I must say, revenge was sweet, but gorey and - interesting. Let's just say that Eric made sure the men received the deaths they deserved. The setting of the movie was dark and VERY gothic. Constant rain filled the scenes of the movie and the city was definitely not a city I would want to roam around in at night. Absolutely loved and enjoyed this movie. A must see for fans of the anti-hero and gothic films. That's one of my favorite cult classics! Glad you enjoyed it! I like the crow too! UMM... I'm feeling like watching it again! The Crow is one of my FAVORITE! movies. Don't bother with the "sequels" though, since Brandon Lee died during filming it, the sequels are kinda bad. That's an amazing movie. I've only seen it once, but I'll never forget it! I love that movie! A while ago (like years, really) one of my guy friends about fell off my couch when I said I hardly remembered the movie. Fifteen minutes later (after he ran home) it was in my dvd player. I agree, the sequels aren't that great so if you don't watch them, you're not missing much. Ooo, sounds good. Nice review! That was a neat idea to review movies too. I love movies and have literally 100s and 100s (think i'm going on 300) of them, but I love books more. I've seen this movie before and liked it. Glad you did too.